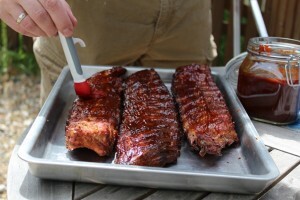 First question when making ribs is, where to get them. 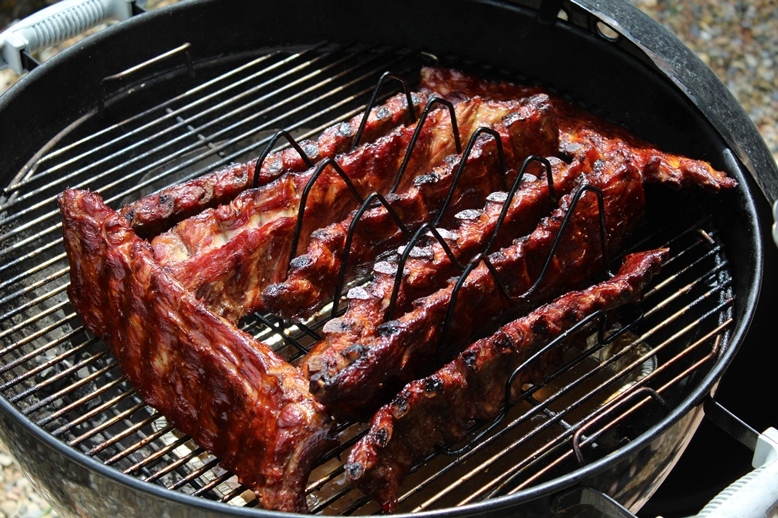 Usually you can get marinated ribs in stores. Unfortunately, they are marinated and have still a membrane in too. 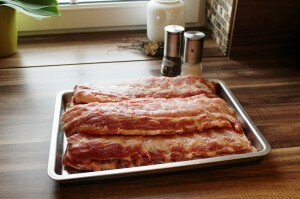 I went to the EDEKA Grossmarkt where they have non-marinated ribs in vacuum sealed packages. The next component is charcoal, which I bought from the grocery stores around here. 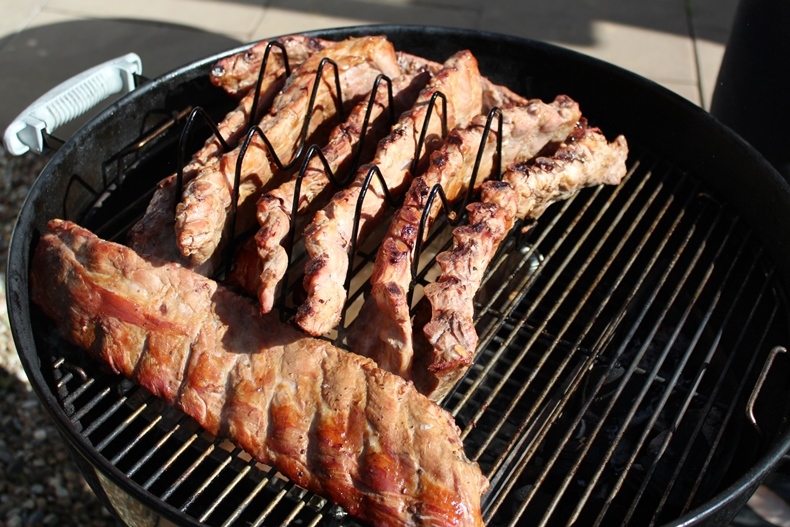 Usually I made good experience with briquettes Grillis from Profagus, they last at least 5 hours and do not leave a pile of dirt in the grill. I gave the woodchips from Jack Daniels a try. Apple juice I got from a grocery store around the corner. 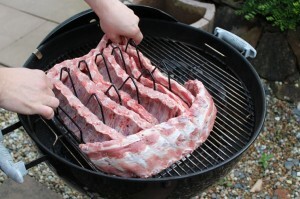 To get the membrane off the ribs, I used two tools: paper towel, knife. The easiest way is to use a not so sharp knife and try to get it between membrane and bone. Ideally is to do it somewhere in the middle. Pull the knife out and push a finger in. Now pulling on the membrane should get it off. If it breaks while pulling, just use the paper towel for pulling the membrane off. Now just add some salt and pepper and I was done with the ribs. 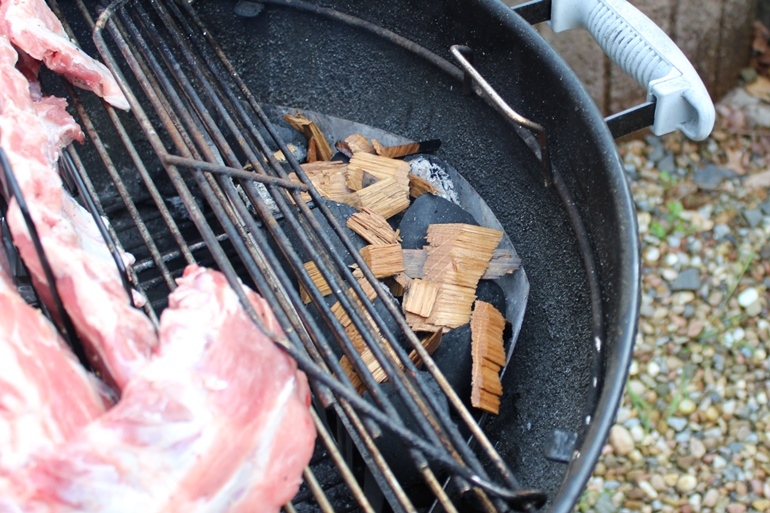 To prevent the wood chips from burning down too quick, I put them into water for 30 minutes. 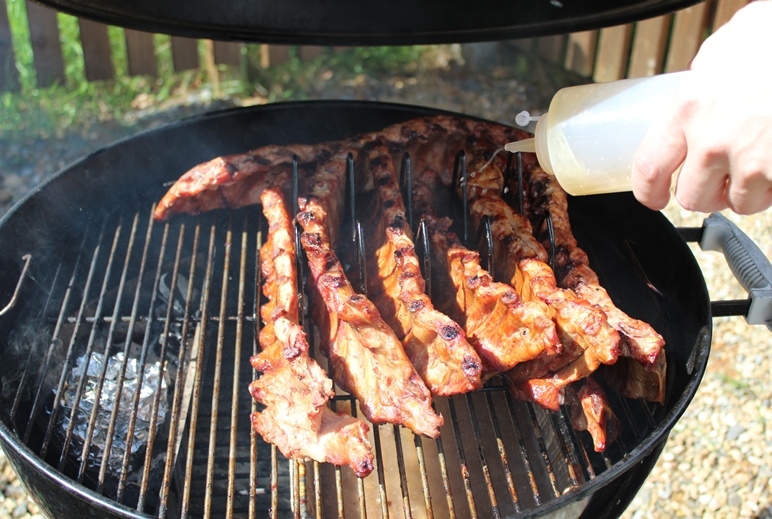 To later prevent the ribs from drying out, I filled up a plastic bottle with apple juice to spray on them from time to time. I then setup the grill by putting the grilling baskets with unfired charcoal into one corner and a aluminum tray filled with water into the middle. To fire up the grill I used a fire starter chimney with just 3 briquettes and when they were red glowing I just laid them on top of the baskets to the other non-fired up briquettes. 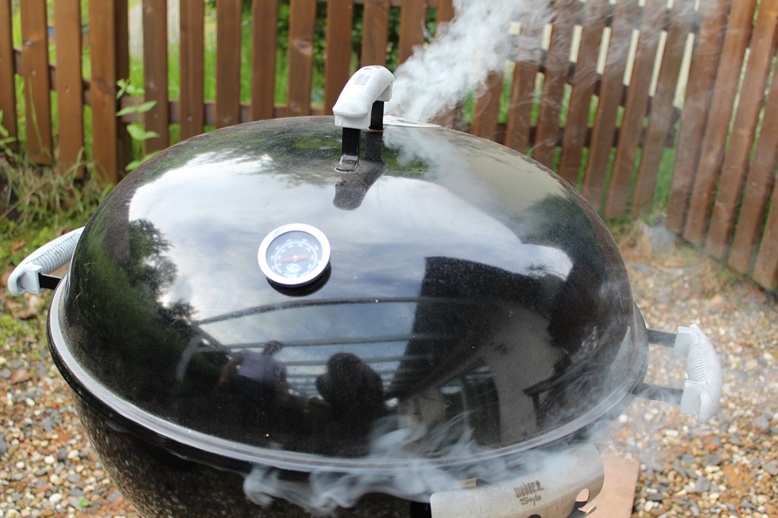 With the vents completely open the grill should start heating up in within the next 15 minutes. I shut the lower vents completely once the temperature climbed to 100 Celsius. This usually causes my grill to stop around 140 Celsius. Now it is time to put on the ribs. I used a rib-rack to be able to get all of them on the grill at once. And finally the wood chips come on and the lid can be closed. I checked the temperature and added more wood chips and gave the ribs a coat of apple juice. 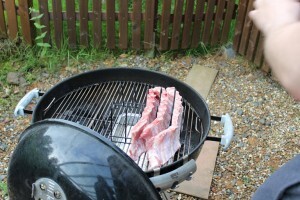 I also flipped around the ribs so that the temperature is applied more evenly. Same procedure. 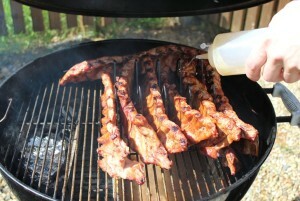 Add wood chips, apple juice and flip them around. Same. 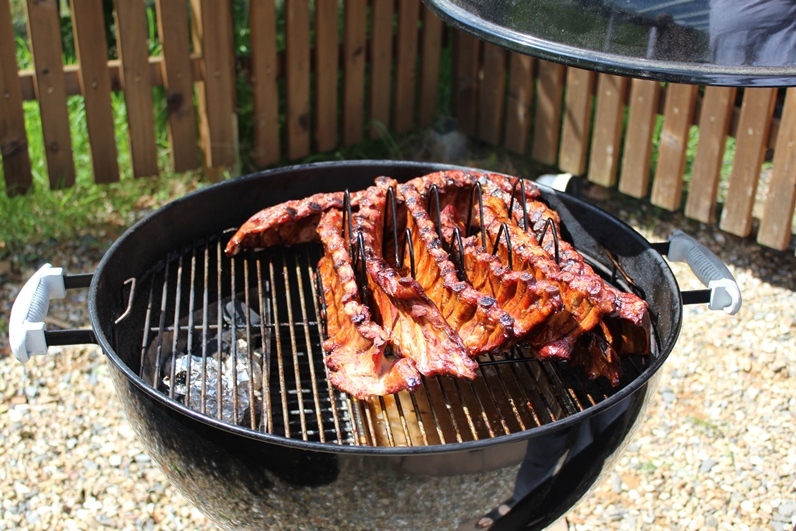 Flip around, mop the ribs with apple juice and put some wood chips in. I flipped them around again and added apple juice. The smell is hard to resist. Now the ribs finally could go off. 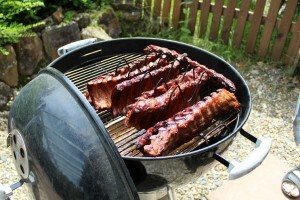 I decided to have the ribs coated in a marinade and left one un-coated. This was to taste what the effect of the wood chips were, without taste of the marinade.